Mallets come in all shapes and sizes. Traditionally speaking, turned mallets are associated with carving and cabinetmakers and joiners use mallets with flat faces. While you would not use a joiner's mallet for carving, you can certainly use a round mallet for joinery. It is a matter of personal taste. The Best Things Lignum mallets are traditional heavy carver's or joiner's mallets, hand turned for us by an American master turner. These beautifully mallets are made to be used, and with the high grade Lignum used for the heads, they should last for generations. The cocobolo handles are reinforced at the joint with a steel rod which is epoxied in using the very best grade of epoxy. The head is made from true Lignum Vitae, not one of the cheaper species that are often erroneously described as Lignum. 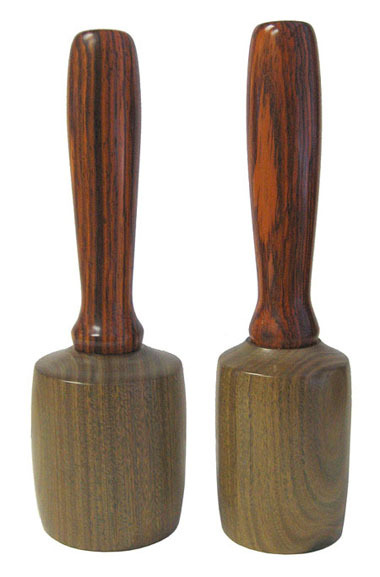 Note: These mallets are hand made and the weights are only approximate, but will not vary much.